The out-of-this-world photo will be unveiled Wednesday. It could prove — or cast doubt — on Einstein’s general theory of relativity. Astronomers will supposedly release the first-ever photo of a black hole on Wednesday. What’s all the fuss about, and what will we learn from it? First of all, black holes are collapsed stars with gravity so strong that even light cannot escape their grasp. One of the black holes we’re expecting to get a glimpse of this week – known as Sagittarius A – is the “supermassive” one that’s at the center of our Milky Way galaxy. Astronomers this week are also expected to release images of another supermassive black hole, one that’s 53.5 million light-years away. 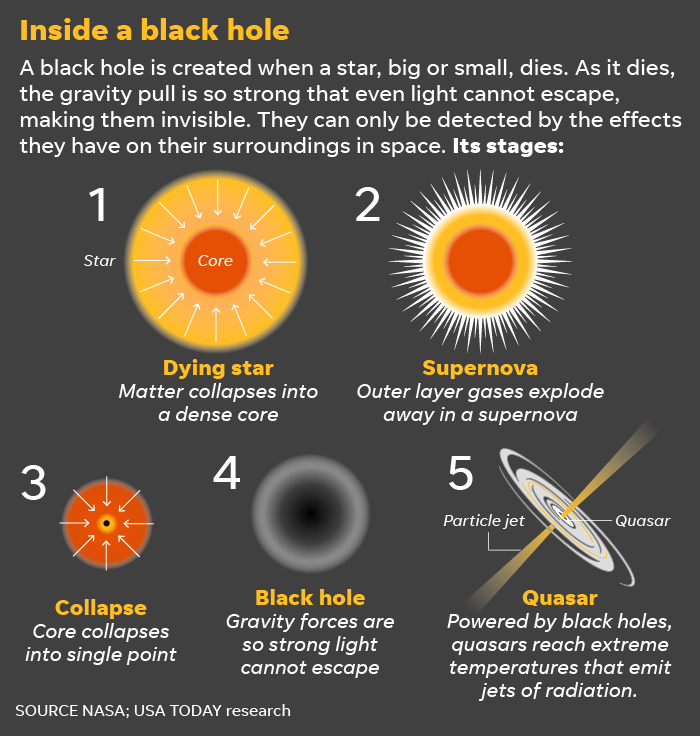 As its name suggests, a black hole is black, so it’ll be impossible to “see” against the black backdrop of space. But nearby objects, such as the event horizon – the edge of the black hole where light can’t escape – could be visible. But that also might be a challenge, since the black hole at the center of our galaxy is “shrouded in a thick cloud of dust and gas,” Science Alert reported. As you might expect, this won’t be your run-of-the-mill photo of the night sky from your smartphone. Images will come from the Event Horizon Telescope, a collection of telescopes around the world specifically designed to peer at black holes. The telescopes are in Chile, Hawaii, Arizona, Mexico, Spain and at the South Pole. The European Southern Observatory will release the first-ever glimpse of Sagittarius A, a collapsed star in the center of our Milk Way galaxy. What does this have to do with Einstein’s theories of relativity? The image from the black hole may give us more insight into Albert Einstein’s theory of general relativity, which he came up with in 1915. According to CNET, the shape of the black hole’s event horizon could prove Einstein’s theory or possibly cast new doubt upon it. Next articleWhy is the US calling Iran’s Revolutionary Guard ‘terrorists’?